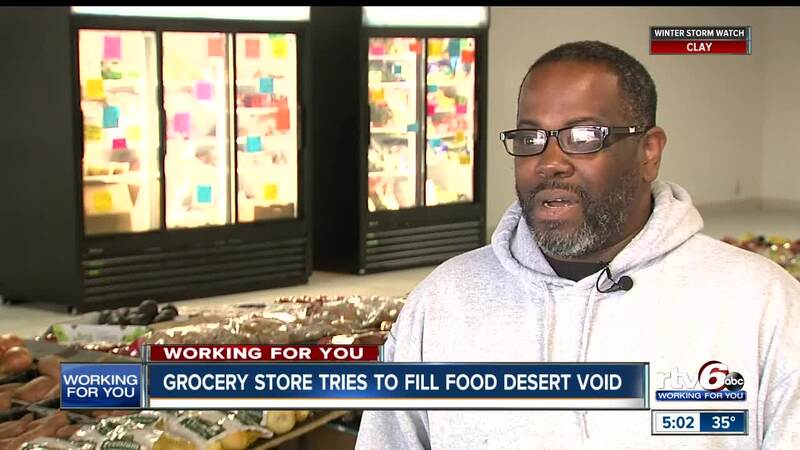 Grocery store tries to fill food desert void. INDIANAPOLIS—A & I Variety Meats and Produce is hoping to meet a need in an Indianapolis neighborhood that could be described as a "food desert" -- an area where big chain stores have pulled out. The small grocery is at 8939 East 38th. Street, very close to a Kroger that shut down. It features vegetables, fresh fruit and frozen meat -- healthy foods that have been hard to come by in the East Side neighborhood. Sonya Liner Hearst and her husband Robert opened the market because they saw a need. "What I bring is totally different," said Robert Hearst, "We have a lot of people from down south. I got food from down south, ham hocks, smoked turkey tails, ox tails." Customer Louvina Franks says the store is a good fit for her. "I just come down the street and come here and get everything I want, except my laundry detergent," she said. The Hearst's have put their life savings into the business which opened last week. The store is open Monday through Saturday from 9am to 6pm, and on Sunday from noon to 4pm.